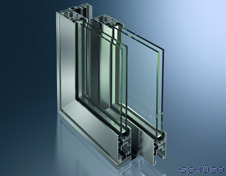 Aluminium is the ideal material for multi-leaf sliding and Lift & Slide systems. The solidity of our thermally broken profiles coupled with good machinability, guarantees precision-fit components. Expect a high degree of energy-saving weathertightness, as well as optimum sound insulation. TRU systems can be combined with curved or specialty segments to create stunning architectural effects and to open up panoramic views with virtually no sight line interference. Constructions include Sliding Doors, Sliding doors with LIft & Slide Technology, and Folding Doors. While the TRU Lift & Slide Mechanism moves glass panels weighing up to 850 pounds with the touch of a hand, all Sliding constructions are impressively smooth and easy to handle. An almost unlimited range of different surface finishes available.